One year later...yup it was one year a go that I bravely faced the day of taking you to your first day of kindergarten. 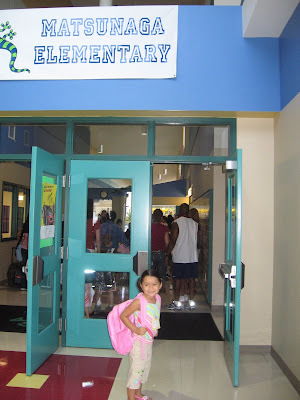 You looked so tiny at your new school, I felt like I had to stay and protect you. I had to stay with you and let everybody know that you were unique and delicate and you had to be protected, treated tenderly. Of course I didn't get to do that. I took you to your classroom, your eyes were shining, you sat at your table, looked at me and said "mommy I think it's time for you to go." I took a thousand pictures and left, my eyes of course were full of tears. I have never tried to keep you all for myself, I have always had the believe that the more love you receive, bigger the gifts for your life. I was right, I am pleased to say that I have raised a bright, independent girl. Your bravery teaches me everyday. I left that day really sad because I felt like school was the first big step of letting you go. I wanted to keep you a baby forever and I also wanted badly to share that moment with someone (That is one bummer about divorce, you face all the big days of your kid's life alone) so I drove off crying. Then the year was full of marvelous surprises and I felt so ready for first grade, then last Monday came and we were both so excited to get to school...then I left you there after taking pictures and being the only mom in first grade taking pictures with my eyes full of tears...I felt like I was loosing you once again. I wondered during the whole time if that was the way it was going to be every first day of school. I felt sad to let you go once again and felt sad to be living that moment alone...then I felt so privileged and blessed to be able to be there, to be able to be with you every first day of all your school years. YOU are so marvelous, so wonderful to love, and smell and share my life with, you are such a wonderful human being that I am certain that just the act of being there and experiencing life along your side its a blessing in itself; even if it means doing it alone.